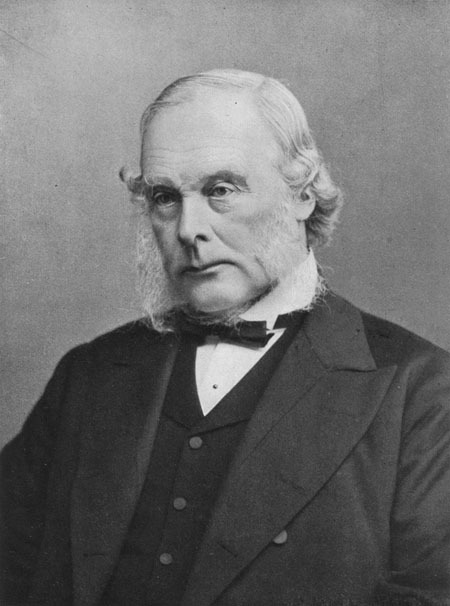 Born in Upton, England, on April 5, 1827, Lister was educated at various Quaker schools, where science was emphasized. As a teenager, he became interested in anatomy and decided on a career in surgery. He received a medical degree from University College, London, in 1852, and the following year became an assistant to surgeon James Syme in Edinburgh. In 1856 Lister was appointed physician at the Edinburgh Royal Infirmary; in 1861 he became head of surgical wards at the Royal Infirmary, Glasgow. In Lister’s time, nearly half of surgical patients died of sepsis (blood poisoning). Believing that sepsis was caused by bad air, he had attempted to decrease the death rate by keeping wards exceedingly clean and wounds tightly covered with bandages. These attempts were futile. Thanks to his wife Agnes, who could read French and translated LOUIS PASTEUR’s works for him, Lister learned of Pasteur’s theory that organic decay is caused by living matter. Lister theorized that sepsis also resulted from such living particles, and in 1865 he began to use a carbolic­ acid solution to clean wounds and surgical instruments. In 1867 he announced that carbolic­acid treatment had kept his wards free of sepsis for nine months, but his news was met with hostility from traditional surgeons. It took several critical successes before Lister’s theories on antiseptics became accepted. He successfully treated Queen Victoria for an abscess, using carbolic acid as a disinfectant. During the Franco­ Prussian war in 1871, his disciples reported that antiseptic surgery resulted in virtual disappearance of gangrene and blood poisoning among their patients. Lister performed a public demonstration of a very dangerous knee surgery in 1877, and again his methods proved successful, finally leading to widespread acceptance of antiseptic surgical procedures. In 1891 Lister helped found the British Institute of Preventative Medicine, later renamed the Lister Institute. In his last years, Lister was honored with numerous awards recognizing his achievement. He died at Walmer, England, on February 10, 1912. Lister’s introduction of antisepsis made surgery much safer, and it provided strong support for the theory that living matter causes infection, one of the basic tenets of modern medicine. Lister’s innovation hit the medical community at a time when physicians were reluctant to accept that microscopic life could significantly affect human health. In the early 1800s, many people believed that changes in the air caused most diseases. Then in the 1840s, Justus von Liebig and Jacob Henle performed the first experiments that hinted at the existence of living disease ­causing agents. Pasteur, in the 1850s and 1860s, showed that living organisms caused fermentation and putrefaction. Lister drew upon Pasteur’s theories and attempted to clean living infectious agents from wounds and incisions. Pasteur’s work was not yet widely accepted, and Lister’s idea was at first rejected. However, Lister was fortunate to see his work fully embraced during his lifetime, and this acceptance helped strengthen the microorganism theory of disease. Lister’s successful public surgery in 1877 forced physicians to accept that carbolic acid worked as an antiseptic agent, and soon all surgeries were performed with antiseptic precautions. The work of ROBERT KOCH in the 1870s then led to aseptic surgeries (surgeries free from disease ­causing agents). He advised the use of steam to sterilize surgical materials; steam treatment left the equipment completely aseptic. Aseptic procedures drastically reduced the number of surgical deaths, and physicians in Europe and North America quickly began to see that a sterile environment prevents infection. Lister’s legacy remains the basis of surgical methodology in modern medicine. Wounds, the sites of surgical incision, and the instruments and general surroundings of a surgery must be kept free of bacteria. Posted on March 9, 2015 by Natalie. This entry was posted in Physicians. Bookmark the permalink.